'Kimberley landscape' was made for the book 'Journey among men' published in 1962 (of which Drysdale and 'Jock' Marshall were joint authors) to illustrate the text "A rough track led us north towards the distant Oscar Range". The book was the result of a zoological tour of north-western Australia in 1958 when Drysdale acted as unofficial artist. 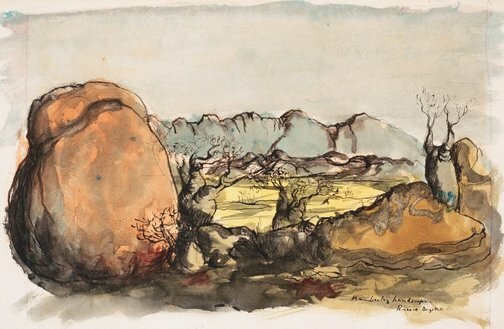 'Kimberley landscape' is a major watercolour, comparable with Drysdale's late landscape paintings and reveals his considerable powers of pictorial invention and draughtsmanship. Signed and dated l.r., ink ".../ Russell Drysdale 61." Lou Klepac, Russell Drysdale: the drawings , 'Drysdale drawings: 'Journey among men' and retrospective', pg. 29-32, Sydney, 2012, 32, 128 (colour illus.). Jock Marshall and Russell Drysdale, Journey among men , London, 1962, 113 (illus. ).